Sculpture in Stone (MFA), no. 077; Sculpture in Stone and Bronze (MFA), p. 108-109 (additional published references). The relief is topped by a simple molding and terminates below in a flat, roughly worked projecting band, which acts as a base for the figures. The heads of the two figures overlap the molding. 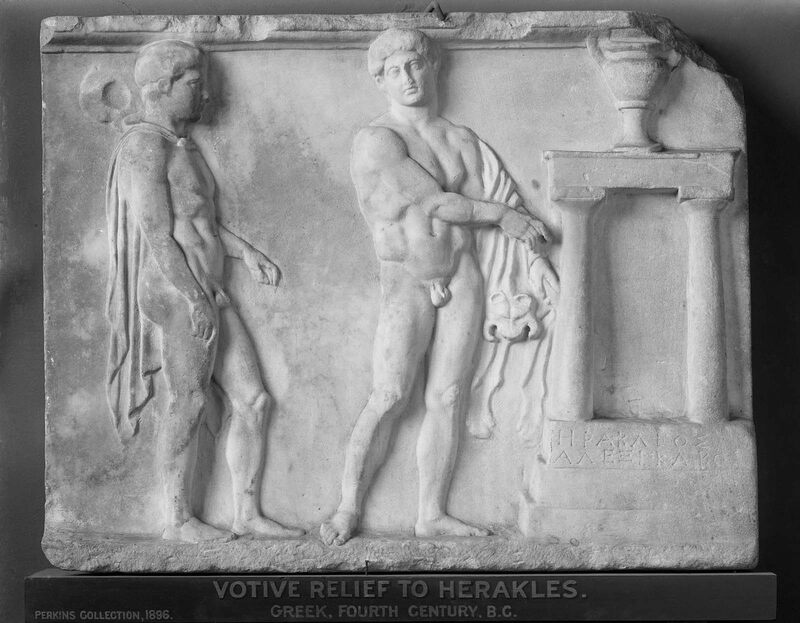 Herakles points his right hand to the shrine beside him. A lion’s skin hangs from his left arm, and his left hand holds a club. Its end, chiseled off, rested on the floor of the shrine. The shrine comprises two unfluted Doric columns on a base of three steps and supporting an architrave with a projecting taenia at the top. A krater on a stand, resembling examples in bronze and ceramic, stands on the architrave. The second youthful figure, gazing at Herakles, wears only a chlamys, and a petasos hanging at his back. His left hand probably held a kerykeion, added in paint and confirming his identification as Hermes. Between the two figures are traces of a painted inscription, in which the name Herakles has been thought to be distinguishable. The top step of the shrine bears the inscription “Herakles Alexikakos” (ΗΡΑΚΛΕΟΣ ΑΛΕΞΙΚΑΚΟΣ), possibly added later, indicating a dedication to Herakles as Averter of Evil. The edges of the slab are smoothed; the back is roughly worked, with an inset area at the bottom. This probably served to set the relief in its base. The upper right-hand corner has been broken off, and the crowning molding has been chipped in several places. The marble has acquired the usual yellow hue. Note: according to Warren’s records.